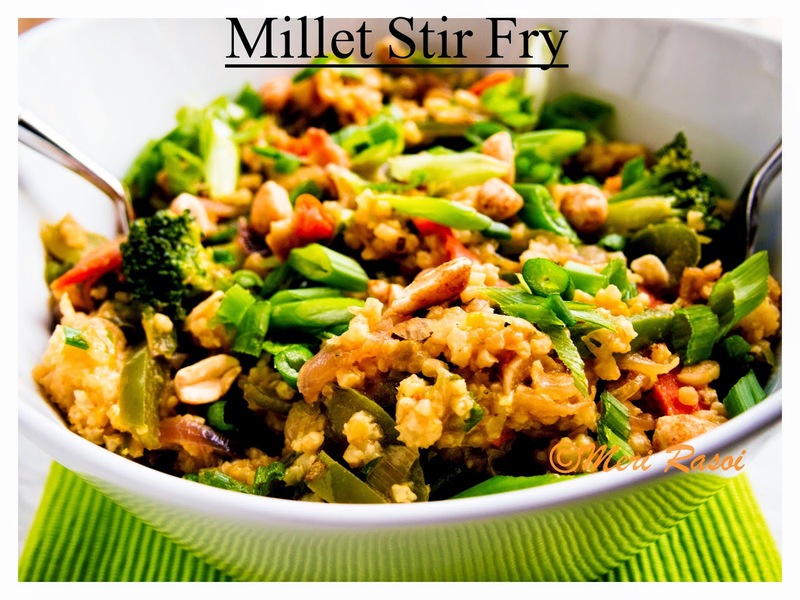 Millet Stir Fry is a delicious and easy to prepare dish that makes a wholesome meal. Mixed vegetables are stir fried, flavored with ginger, garlic and chillies. 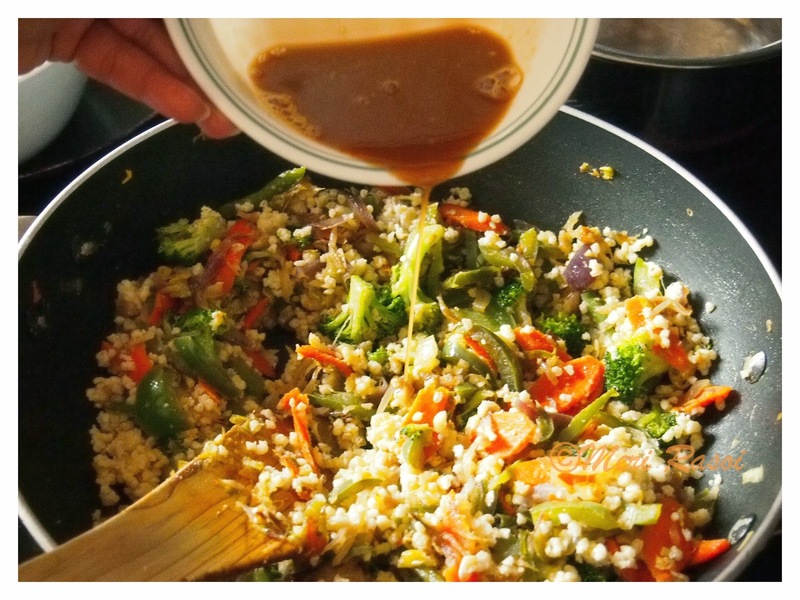 After the addition of cooked millets, the mixture is drizzled with soy sauce- honey- rice vinegar solution. 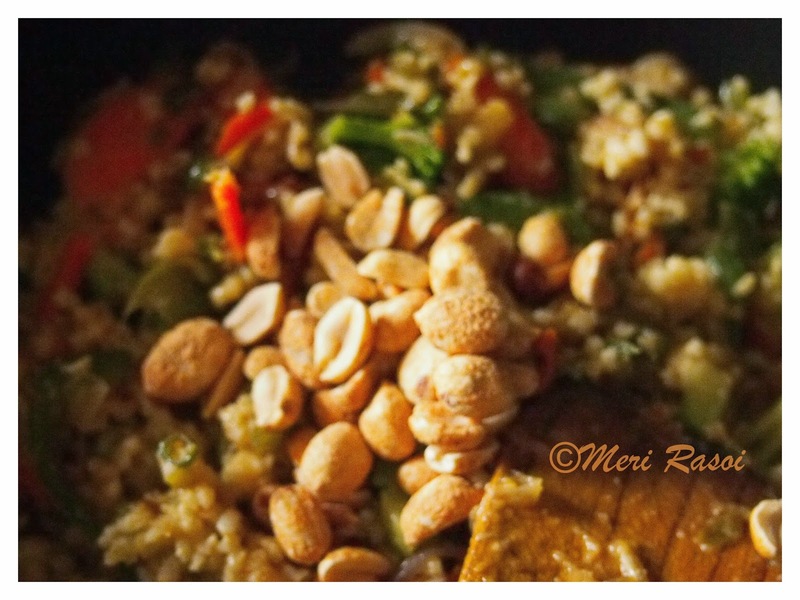 Lastly , millet stir fry is garnished with roasted peanuts and spring onion greens. A wholesome gluten free meal is ready to be served. I have been mostly wheat and rice person. But recently, I started including gluten free food in my day to day cooking. I will not say I have shifted completely to gluten free food but there is a conscious effort to have a gluten free meal as much as possible. In such an effort I brought home a pack of millets some time back. I saw a recipe at the back of the pack. 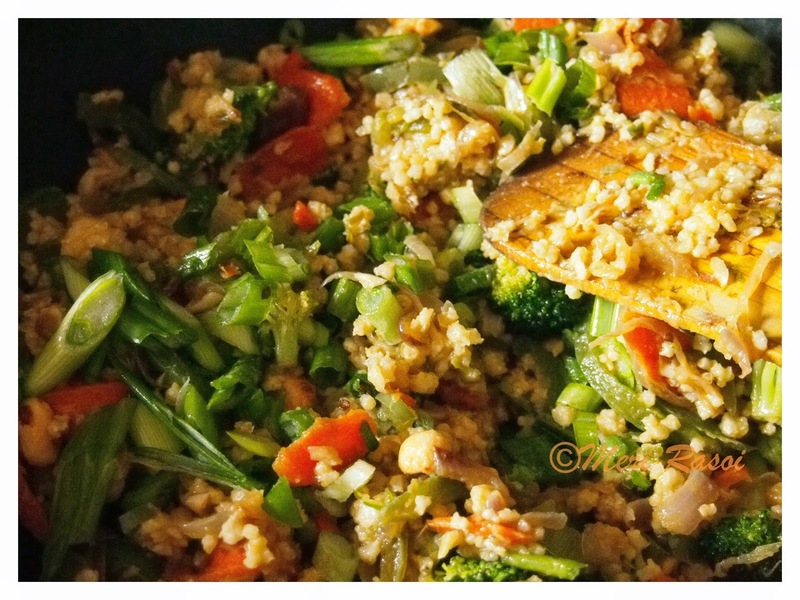 I made a few changes to the recipe and my version of Millet Stir Fry was born. Apart from being gluten free, Millet is also alkaline which makes it easy for the body to digest it and helps balance the body's natural tendency towards acidity. 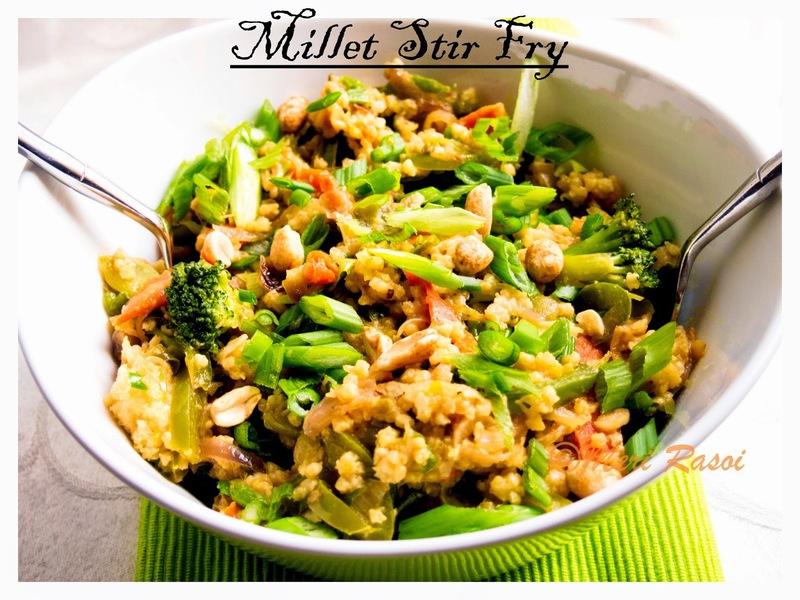 Millet is also rich in dietary fiber making it a great solution for those who want to add more dietary fiber to their gluten free diet. Apart from this, Millets are rich in B vitamins, calcium, iron, potassium, magnesium and zinc. But there is one word of caution, Millets are also mild thyroid peroxidase inhibitor and hence should not be consumed by those suffering from thyroid disease.For more information on Millets, click here. 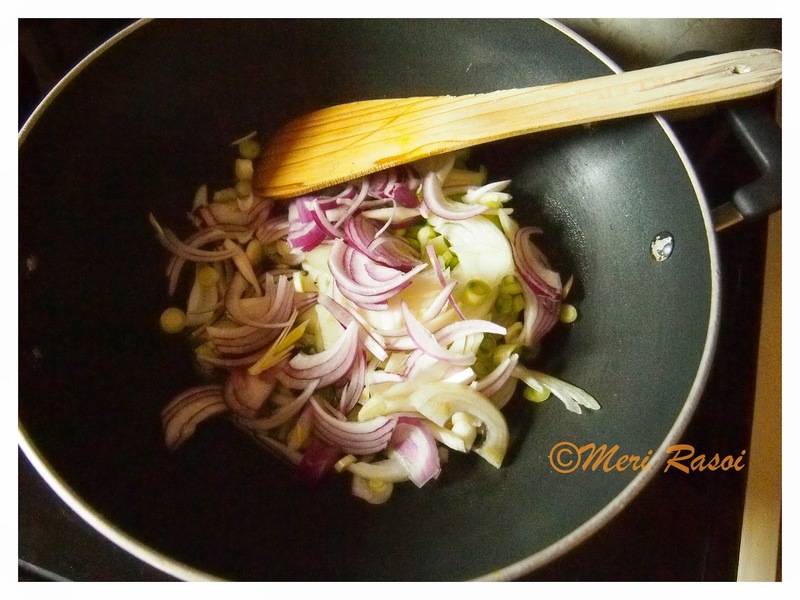 Coming back to the dish, this is how you too can make this stir fry. Bring water and salt to boil in a pot. Add the millets, return to boil gain. Cover and cook in low heat for about 35-40 minutes.Once done, fluff it up with a fork and set it aside to cool. Heat oil in a large pan. 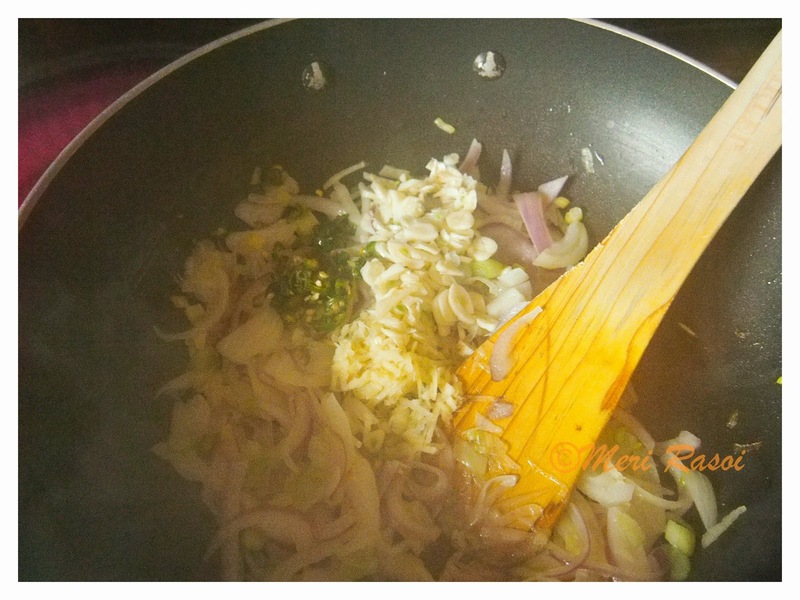 When hot, add onion (also add the white portion of the green onions)and cook until its soft about 5 minutes. Add grated ginger and garlic and cook for a minute. 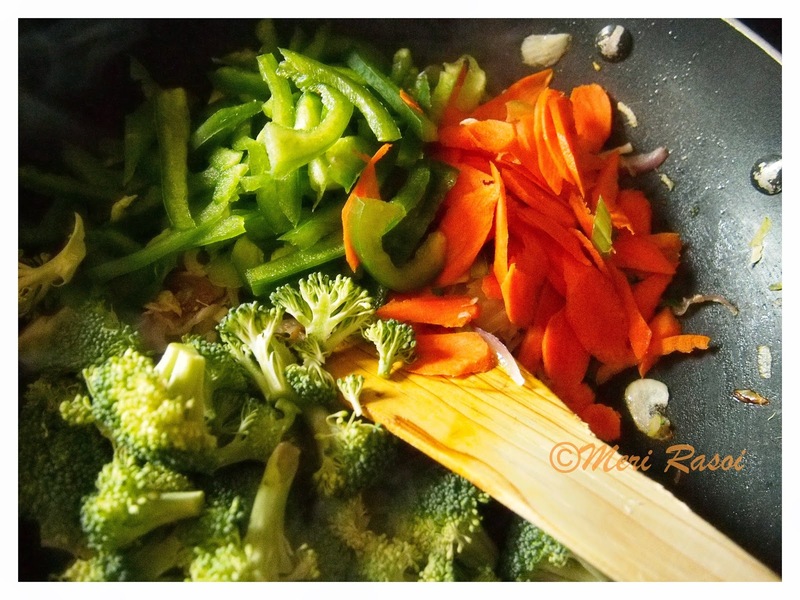 Add the broccoli, bell pepper and carrots. Cook until the vegetables are crisp and tender. 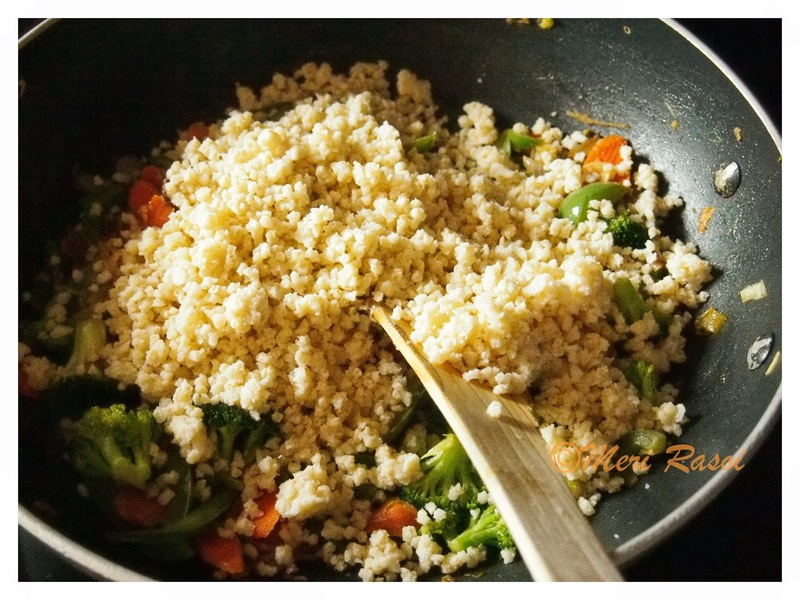 Once done, add the cooked millets .Millets should be brought to room temperature before adding . Combine soy sauce, rice vinegar ,honey and cornstarch. Drizzle this mixture over the stir fry. Cook until the sauce is well absorbed. Adjust the salt if needed. Lastly add roasted peanuts and chopped green onions. Wow!! its something new dish to me & quite inviting ,I try for sure . looks wonderful and healthily inviting!! Definitely millets are healthy. Converting it to a delicious meal is another heavenly idea. 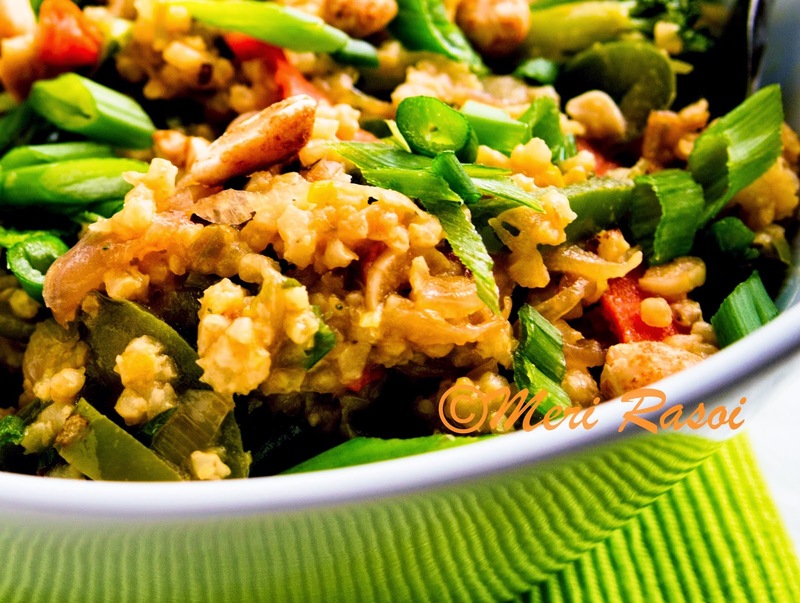 We however seldom prefer it, Our life is all about rice.